Birthdays are one-day celebrations. When you send a Gift or Greeting Card a few days later, your good wishes might be interpreted as a slight mistake. 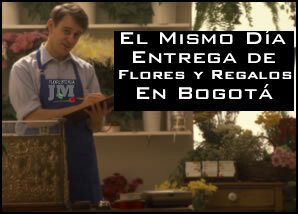 That's why Floristería JM wants to help you by offering a Same Day Delivery of your Birthday Gift in Bogota. Browse through our wide ranging variety of Gifts and Flower Arrangements and look at the table below for the specific details of our Same Day Delivery service. Remember to Choose TODAY'S date. We offer Same Day Delivery on any Product, EXCEPT: Fruit Arrangements and Gift and Food Baskets. For Deliveries on Sunday or Holidays, place your Order One Business Day BEFORE by 4:00 PM.